WAITSFIELD, Vt. — The Vermont of postcards is never hard to find. Covered bridges, dairy farms, and sleepy Main Streets dot the state’s rolling greenscape, edge to edge. Even the grain silos are quaint here. But if you had to condense the region’s ineffable charm into one living, breathing community you’d likely be straddling the banks of the Mad River, staring at the streets of Waitsfield as it surrounds you. Just fewer than 200 miles from Back Bay, the town is within striking distance for a wondrous weekend escape. And for a place only a mere 1,700 folks call home, you’ll be amazed at how much action you can jam into those 48 hours. Or you might end up doing nothing at all. In a place like Waitsfield, that can really be something. Traveling to Waitsfield mostly involves interstates, until the final 40-minute leg; a scenic stretch of state Route 64 winding its way across Roxbury State Forest. Land at the Yellow Farmhouse Inn, commonly regarded as the crown jewel of the town’s dozen or so bed and breakfasts. The family-run establishment scores high marks for its inviting warmth, emanating both from its proprietors, as well as the gas stoves located inside most rooms. Spacious quarters, each named after a woman of a bygone era, (Stephanie, with her cherry poster bed, is an old standby) start at $149 a night. When it comes to recreation this time of year, one activity is on a mountain above the rest. 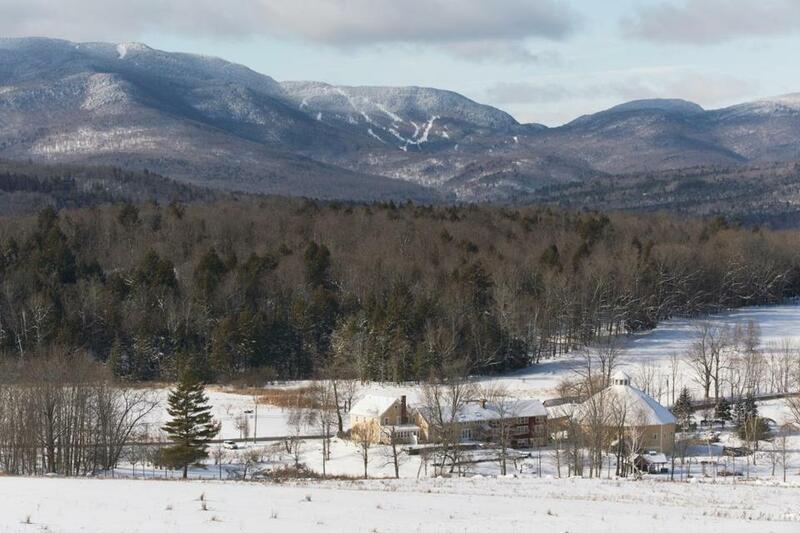 That mountain, of course, is Mad River Glen, which stands alone as the only skier-owned resort in the United States. Lift tickets are a reasonable $79 on Saturdays and Sundays, and the challenging terrain is just 10 minutes from the front porch of your inn. 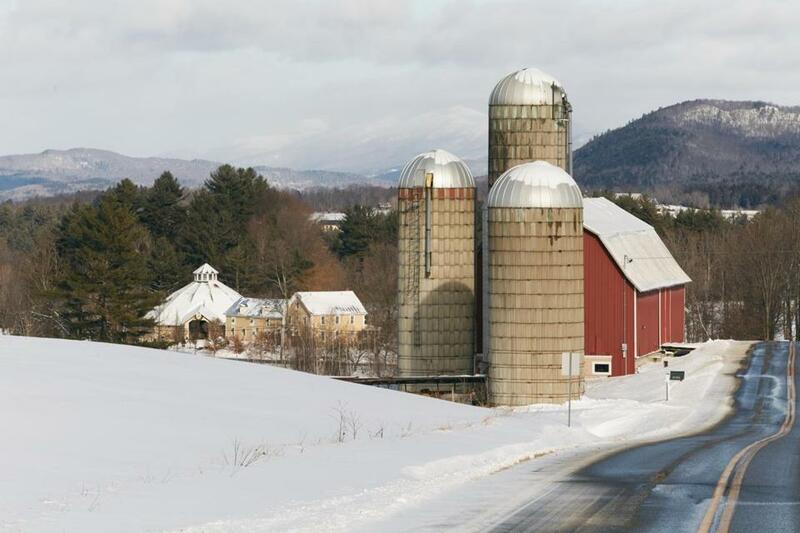 The Inn at The Round Barn Farm, with the Mad River Glen Ski Resort in the background. 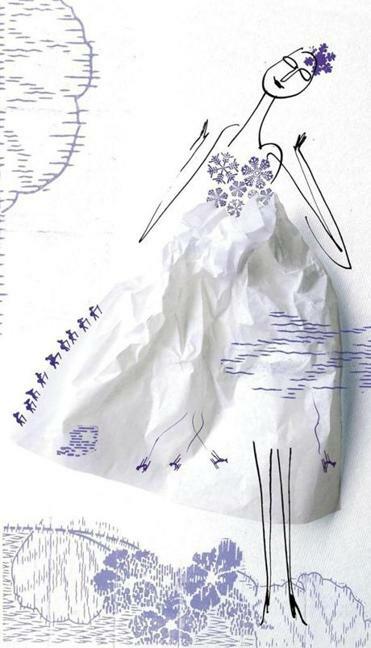 Certain pastimes in the Green Mountain State, skiing included, play more like obligations. You can check most of them off your list in and around town, as you ride through the Pine Brook Covered Bridge on your way to bagging pure maple candy at Hap’s Mountain Sugar Works. The Inn at Round Barn Farm , a 19th century farmhouse on 245 acres, is one of New England’s premier wedding destinations. But Waitsfield also sneaks a series of unexpected surprises into its downtown landscape. You likely hadn’t planned on enjoying Mexican food in this part of the world, yet the Mad Taco plates a smoked pork belly taco that would stand out even in latitudes far south of here. St. Louis style spare ribs are falling off the bone at Localfolk Smokehouse, where the barbecue — all smoked in-house — pairs naturally with the juicy IPAs from Lawson’s Finest, brewed just 10 miles down the road. Mint assembles chef-driven vegetarian cuisine with seasonal sophistication. It also doubles as a tea lounge during the day. French-infused Peasant is the undisputed destination for high-end gourmet. Its daily ragout special is downright slurp-able. In true French fashion, its secret ingredient likely involves around five pounds of salted cream. Grab your skis, snowboard, fat bike, climbing gear — and appetite — and head for the hills. In a frills-be-damned setting — folding metal chairs pass for standard seating — American Flatbread spins pizza with Vermont pizzazz. A thin dough of organic wheat, topped in any number of local cheeses, emerges from an earthen, wood-fueled oven, bound by a proper crust that splits the difference between crisp and chewy. The Vermont Sausage ($22) features house-made, maple fennel-infused pork from a neighboring farm. The success of the restaurant, a Waitsfield fixture for more than 20 years, has given birth to two additional hearths, in Middlebury and Burlington. Although the farmer’s market operates only from May through October, and the handful of local farmstands have long shuttered for the winter, produce is still plentiful. Sweet Pea Natural Food — bold enough to bill themselves as “New England’s first plant-based market and cafe” — will stave off the green juice junkies. Unapologetic carnivores are kept at bay with fine pates, brisket, and porchetta from The Butchery, just off Main Street on Mad River Green. For dessert, don’t skip The Sweet Spot, scooping its very own Scout’s Honor, small batch ice cream. Maple is a predictable classic, but the salted caramel is sublime. For a more adult treat, visit Mad River Distillers, located in a 150-year-old renovated horse barn on the southern edge of town. Noteworthy releases include the slightly sweet Maple Rum, finished in maple barrels; Corn Whisky, distilled from organic Vermont heirloom corn; and Malvados, a unique apple brandy, inspired by the Calvados style of Northern France. The tasting room is open on winter weekends from 11 a.m. to 4 p.m. Distillery tours are offered by appointment only. Call 802-496-6973 to schedule. 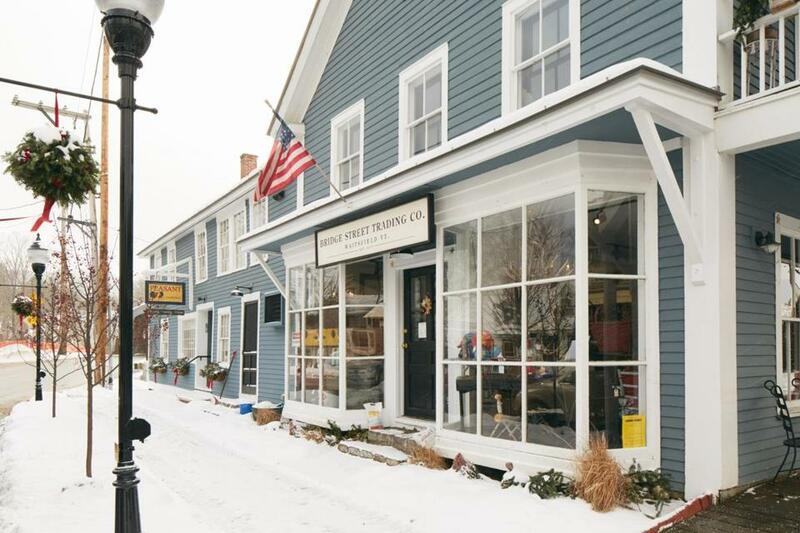 Bridge Street in Waltsfield, Vt.
Peppering Main Street are galleries and art collectives spanning every medium from glass to stoneware. The Artisan’s Gallery is a great place to start. It showcases the work of some 175 Vermont artists, including practical items for purchase: ceramic mugs fashioned to look like birch, and clay-wrought birdhouses. Luminosity Studios, repurposed from an old church, specializes in stained glass and custom-designed period lighting. Just a couple of doors down, David Leppla and his wife, Melanie, sculpt glass art in their working studio, Mad River Glass Gallery. Open daily from 10 a.m. to 5 p.m., visitors can marvel at live demonstrations inside the hot glass facility. Waitsfield is a welcome release from the trappings of urban commotion. Catharsis assuming the form of small-town Americana. But just beneath the sheen of “aww shucks” serenity is the sensibility of a culture far more aware than first glance suggests. It would be gross mischaracterization to regard Waitsfield as some ruralized hipster enclave. Yet, here is a town with art collectives, its own micro-distillery and farmer’s market, offering farm-to-table cuisine decades before it was cool. It has its own raw pet food purveyor! All this, alongside bed and breakfasts, and maple sugar houses, amid the shadows of dense evergreen forest. You’d be tempted to read it all together as a place with an identity crisis. But there’s no confusion here. The identity is pure Vermont. Crisis awaits back in the city. Brad Japhe can be reached at braphe@gmail.com.